AirREX offer the highest quality, air suspension systems in the world. 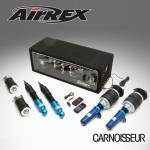 At Carnoisseur we are delighted to offer the latest range of complete AirREX systems, including struts, management system and wireless remote. Most Carnoisseur Outlets can offer a complete fitting service for AirREX air ride suspension kits - contact your local Outlet for details.